Following an agreement signed between Teatru Astra and the Public Broadcasting Authority (PBS) earlier in October 2014, it has been recently announced that PBS will air Teatru Astra's most recent opera on Wednesday 14 January 2015 at 20.45hrs on TVM 2. In a recent press communication, PBS has stated that the forthcoming airing is an important and historical milestone for television broadcasting in Malta. Teatru Astra also considers this to be another important feat in its history of producing operas. The 2014 Nabucoo at the Astra was a booked-out double performance, staged on the 23 and 25 October. Enrico Stinchelli, a leading authority in opera was the artistic director. Prof Joseph Vella, resident conductor at Teatru Astra was the musical director. Dr Maria Frendo was the chorus mistress. 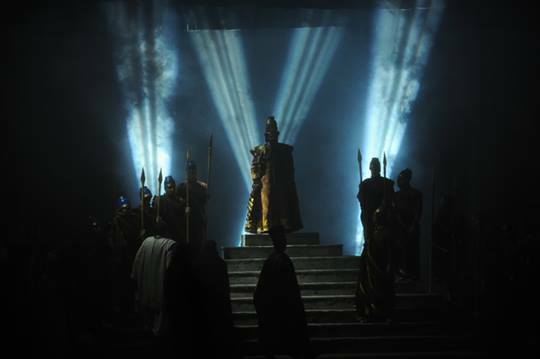 The widely acclaimed set, which has recently been transported and set up in another Nabucco stage in Rimni, was construed by a team of volunteers led by Gozo artist and Teatru Astra's scenographer Joseph Cauchi and Andrew Portelli.